Welcome to my latest Weekend Reading edition where I share some of my favourite articles from the personal finance and investing blogosphere. Here was my latest dividend income update – a new milestone is on the horizon. These are the friendly dividend histories of many great Canadian stocks. Should you change your ETF strategy as you get older? Maybe not as much as you think. Enjoy your weekend and see you here again next week! Sun Life (SLF) raised their dividend by 5% this week. Major material stock Nutrien (NTR) increased their dividend to $0.43 USD. Telus increased their dividend for the second time this year. Canadian Tire (CTC.A) hiked their dividend. Doug Hoyes mentioned it’s not the technical part that we’re getting wrong when it comes to debt (i.e., how to make a budget), it’s our behaviours. From Doug: “It’s not how much debt you’ve got, it’s what you’re paying each month.” – that you really have to pay attention to. I know in our case, the latest 0.25% interest rate hike added about $10 to our bi-weekly mortgage payment. I’m really looking forward to becoming debt free someday. That will be immensely liberating. Enbridge Inc. recently announced they are suspending their dividend reinvestment program and share purchase plan, known as a DRIP, effective immediately. That means shareholders will not be given the option of automatically having dividend payments in the form of additional shares. Wise move? Very much so in my book given where markets might be headed (? 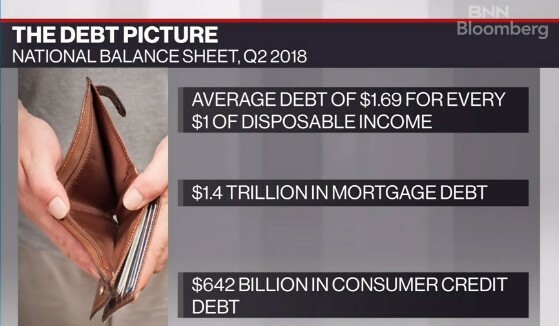 ), the need for Enbridge to get some debt under control, and given DRIPs are normally used to maintain demand for a stock price in times of market turbulence. This Financial Independence, Retire Early (FIRE) stuff remains interesting to me but it’s definitely not something I’m chasing. Besides, I prefer FIWOOT – Financial Independence, Working On Own Terms. Although I can’t say this study has any credibility given the results, Canadians feel the average salary they need to be comfortable is $250,000 – per year. Andrew Hallam shares how to achieve FIRE (Financial Independence, Retire Early) with stock market crashes. Fall savings and deals for My Own Advisor readers! Not sure about the best low-cost ETFs to own? I have a page full about the best low-cost funds to buy and hold here. If you want further details and unbiased advice, consider this free trial to some of the best stock and ETF research available in Canada. Use promo code MYOSF for a special offer when opening your BMO SmartFolio account. In doing so, you won’t pay fees on your first $15,000 invested for a year. Invest better: I can get you $50,000 managed FREE for a year thanks to my partnership with ModernAdvisor. There are more savings to be had on investing accounts, home phone, cell phones and more on my Deals page here. Thanks to a passionate reader on this site, interesting article here about the inverse relationship of pension commuted values and interest rates. “We believe that taking the commuted value of a pension, if you are lucky enough to be able to do so in today’s interest rate environment, is something to consider strongly.” Therefore, in a low interest rate environment it might be a very good time to consider “taking the cash”. Then again, if you have health benefits tied to your pension you might want to reconsider. Predicting the future is hard! Here’s how to create a zero-based budget. Monitoring your credit scores can help you become better with credit. Like chocolate, credit is just fine in small doses as long as you don’t take on (eat up) too much. Here is some information about credit scores, including how they are calculated here in my 101 post. 36 Responses to "Weekend Reading – More dividend hikes, average debt, lower robo fees and more #moneystuff"
$250K average salary to be comfortable..my generation $398K??? What does “comfortable” mean? Based on this clearly few will ever be comfortable. I don’t put much credibility into this survey. Good interview with Doug Hoyes. Behaviour indeed and the unplanned for potential of surprises like illness, job loss etc. = no plan B. Re Enbridge, it’s not entirely clear for those with synthetic drips at their discount broker that this will be discontinued. I’ve yet to check with mine. Yeah, that survey data is rather useless but I did find it interesting…hence the link. Just so odd really. On this Remembrance Day weekend I’d also like to thank all of those serving in the military and especially those war veterans who served and those making the ultimate sacrifice. This weekend commemorates 100 years since WW1 ended. Canadians played a crucial role in winning the Great War. Their considerable efforts made the world and this country a better place. Lest we forget. Thanks Gary. Have a great weekend. Massive sacrifices were made and a lot of heroes died so we can stay free !! Indeed. Lots of courage and bravery to fight for ours and others liberty. Absolutely many, many sacrifices. So many lives lost so we could have a better future. Well said and thanks for sharing that. I was reflecting upon those sacrifices quite a bit today. Thanks. Same here. The appreciation in parts of Europe is quite amazing too. I think we had 635k serving in a country of 8M at the time. That’s incredible when you think about it…not to mention hundreds of thousands in indirect support roles. Mark: “FIWOOT”, that’s pretty good, but it just doesn’t have the same ring. How about “FIRE” – Financial Independence, Resign Early? I don’t mind my FIWOOT! 🙂 Cheers. This might help with an accurate #. Gives you the cash amount to. Thanks RB.. I did use that but wanted to see how the rounding worked out. In my delusional mind I feel I’ve won something in that all three of our holdings rounded up. I never really looked, did they mention a date that this would all be accomplished by? ENF changeover to ENB took place Nov 8, after being voted on Nov 6. I imagine to reflect in our broker accts may take a little while and may vary by broker. LOL, you took my fifteen bucks or so as I was rounded down. You probably know we are also eligible for 2 dividends initially – ENF payble on Nov 15 and ENB 4th qtr one payable on Dec 1. Ya, I was referring to how long it will take for this to show up in the accounts. In the big picture I guess it doesn’t really matter, it will show up when it shows up. The back to back dividends are nice. I may call broker and ask on timing, because I also want to find out if the ENB synthetic drip will continue. ENB will now be my largest single stock position by a fair bit. Not sure if that’s good or bad. Ya, we own a bunch of ENB as well. Not quite my largest single stock holding yet but close. thanks for the link rbull. i round up on all three accounts as well. I’M RICH!!!LOL. Probably a good bet the ship will get righted. Got a little jump when I logged on today and saw my balance drop some unexpectedly. ENF is showing zero $$ as its delisted. Message was there saying tomorrow IIRC it would show as 31.88 x shares and had a link to ENB to verify when broker will receive transfer from them. I mistakenly deleted that before clicking. So its moving along. Nice…the transfer is coming along then!! Yep, should be soon. I also verified that the drip I had for ENF in my LIF would continue after the transfer to ENB. Broker RBCDI buys stock on the open market to do the synthetic drip so ENBs cancellation of it is no issue. Other brokers may vary of course. It really depends on the treasury vs. market drip. Cancelling the company DRIP and SPP with the transfer agent is one thing that doesn’t always impact what the brokerages do when you register for a synthetic DRIP. BTW – got my ENB shares for ENF. 149 ENB shares with some cash. Yes, I knew that and why I called to verify it wouldn’t stop. My ENB shares came over yesterday as well as cash. Some of them may be moving in kind from LIF into unregistered in Mar. to join most of my ENB, as my min withdrawal without withholding tax. Nice…it will be interesting to see if Brookfield ever does something similar. i.e., simplify organizational and dividend structure. We’ll see long-term I guess. Brookfield – I couldn’t imagine to begin to try and untangle that. Many more companies, many more countries, lots of buying and selling etc. Who knows. Must have some pretty busy accountants. Just checked (4:40 CST) my ENF at TDDI, no action. I know TDDI carried on with the REI DRIP when REI suspended it so I’m going to assume they will for ENB as well. We will see. Probably same deal as RBCDI. No change to them continuing to buy stock to do drip. TDDI has enb and cash posted yesterday. I surely hope they continue to do the drip. I have 922 shares of ENB all in registered accounts. That’s a lot of ENB! Well done. My math tells me that’s >$600 per quarter 🙂 More than enough to pay your heating bill for life from ENB stock.